Select a Show * The 25th Annual Putnam County Spelling BeeAidaDisney's Aladdin JR.Disney's Aladdin KIDSAnnie JR.Annie KIDSAnnieDisney's The Aristocats KIDSAvenue QDisney's Beauty and the Beast JR.Disney's Beauty and the BeastBilly Elliot The MusicalBring It On The MusicalCatch Me If You CanChitty Chitty Bang Bang JR. Chitty Chitty Bang BangDisney's Cinderella KIDSDisaster!The Drowsy ChaperoneElf The Musical JR.Elf The MusicalFame The Musical JR.Fame The MusicalFiddler on the Roof JR.Fiddler On The RoofFreaky Friday One-Act EditionFreaky FridayDisney's Frozen JR.A Funny Thing... ForumA Gentleman's Guide to Love and MurderGodspell JR.Godspell 2012GodspellGuys and Dolls JR.Guys and DollsHairspray JR.HairsprayDisney's High School Musical – One Act EditionDisney's High School Musical 2 JR.Disney's High School Musical JR.Disney's High School MusicalHonk! JR.Honk!How To Succeed In Business...The Hunchback of Notre DameInto the WoodsRoald Dahl's James and the Giant Peach JR.Roald Dahl's James and the Giant PeachDisney's The Jungle Book KIDSJunie B. Jones The Musical JR. Junie B. Jones, The MusicalLegally Blonde The Musical JR.Legally Blonde The MusicalDisney's The Lion King JR.Disney's The Lion King KIDSDisney's The Little Mermaid JR.Disney's The Little MermaidLittle Shop of HorrorsMadagascar – A Musical Adventure JR.Mamma Mia!Mary Poppins JR. Mary PoppinsRoald Dahl's Matilda The MusicalDisney's Mulan JR.The Music Man JR.The Music Man KIDSMy Fair Lady NewsiesOliver! Once on This Island JR.Once On This IslandPeter and the StarcatcherPeter Pan (1954 Broadway Version)Disney's Peter Pan JR.Pippin Revival VersionThe Pirates of Penzance JR.The Pirates of PenzanceRent School EditionRentSchoolhouse Rock Live! JR.Schoolhouse Rock Live!Seussical JR.Seussical KIDSSeussicalShrek The Musical JR.Shrek The MusicalSingin' in the Rain JR.Singin' In The RainSister ActDisney's Sleeping Beauty KIDSSweeney Todd School EditionTarzanThe Theory of RelativityThoroughly Modern Millie JR.Thoroughly Modern MillieUrinetownThe Wedding SingerWest Side Story School EditionRoald Dahl's Willy Wonka JR.Roald Dahl's Willy Wonka KIDSRoald Dahl's Willy WonkaDisney's Winnie the Pooh KIDSXanadu JR.
MTI has teamed up with renowned design firm Subplot Studio to create awesome artwork for your next production so you don’t have to. Customizing your next musical poster is easy and works in conjunction with your purchase of an official Logo Pack from MTI. Choose a Poster: Search the library, find your next production and pick your favorite poster artwork. Customize Online: Easily add your organization name, show dates, times, credits, and contact information. Download Instantly: After you customize and approve your poster, you can download a high-resolution print-ready PDF. Order Prints: Order high-quality, professionally printed posters with your customized artwork. Visit subplotstudio.com and customize any poster for $200. Before checkout, you will be asked to provide your MTI Access Code, which is provided with your booking confirmation and also accessible via MyMTI. Each Customizable Poster or Design Bundle purchase includes a downloadable Logo Pack. If you already purchased the Logo Pack directly from MTI, then you will receive a $75 discount at checkout. For additional assistance, please contact Subplot Studio at (805) 996-0808. Note: Additional poster prints in 22” x 34” and 33” x 51” sizes that can be ordered in any quantity. Starting at $75 for 25 posters. Note:If you have already purchased a Logo Pack, you can purchase a Customizable Poster for $125 or a Design Bundle for $225. Discounts available for Educators. 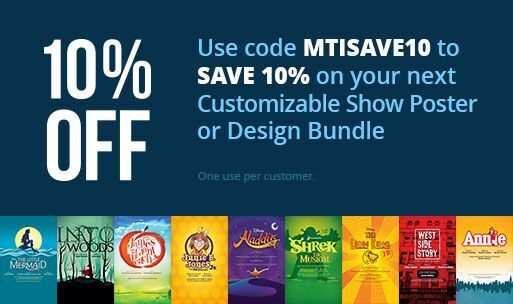 All purchases require an MTI Access Code as proof you have a valid license to produce an MTI show.